Fresh peppers at the farmers’ market. Photo by Debbie Roos. The North Carolina Cooperative Extension, Chatham County Center is partnering with NC State Extension to offer an all-day Produce Safety Alliance Grower Training on Thursday, January 31, 2019. The training will be from 8:30 a.m. until 5 p.m. at the Chatham County Agriculture & Conference Center in Pittsboro. This course meets the regulatory requirements of the FDA’s Food Safety Modernization Act (FSMA) Produce Safety Rule. The Produce Safety Rule requires all farms that grow, pack, harvest and/or hold covered produce, making over $25,000 in annual produce sales (average over the last three years) and not qualifying for an exemption from the rule to attend this training. For a step-by-step guide of who needs to attend this training, see who is mandated to attend PSA trainings. This is a one-page document that provides a summary of exemptions under the PS Rule. Be aware that for exempt or qualified exempt farms that are not required to attend a PSA Grower training there are other requirements that must be fulfilled. Note: The training is open to all growers, even those not required to attend. It’s an excellent opportunity to learn more about produce safety. In addition to learning about produce safety best practices, key parts of the FSMA Produce Safety Rule requirements are outlined within each module. View the agenda for the training. Participants will be eligible to receive a certificate from the Association of Food and Drug Officials (AFDO) that verifies they have completed the training course. To receive an AFDO certificate, a participant must be present for the entire training and submit the appropriate paperwork to their trainer at the end of the course. The cost of the workshop is $50 for NC residents and $100 for non-residents. The registration fee includes meals, the Produce Safety Alliance manual, and the certificate of participation. A GoldenLeaf Grant is supporting this training and offsetting the registration costs for a limited time. Space is limited so make sure and register early. The registration deadline is January 24, 2019. Register online. Click on the session you want to attend, then scroll down and click the Register Now button on the right side below the list of trainings. If you have any questions about the January 31 training, email Debbie Roos. Growing Small Farms is the program of Debbie Roos, Agriculture Agent for the Chatham County Center of North Carolina Cooperative Extension. Many of Chatham’s newer farms are owned by first-generation farmers attracted to the challenges and rewards of making a living from the land. Chatham has a large concentration of farms practicing organic and sustainable agriculture that strive to be environmentally responsible, economically viable, and socially just. In a time when the trend in conventional agriculture is towards fewer and larger farms and many of North Carolina’s “conventional” farmers are struggling, the sustainable and diverse agriculture practiced by Chatham’s small farms provides the best hope for keeping agriculture a viable part of the community. Chatham’s proximity to upscale Triangle-area markets ensures a steady demand for the organic and sustainably-grown crops produced by area farmers. 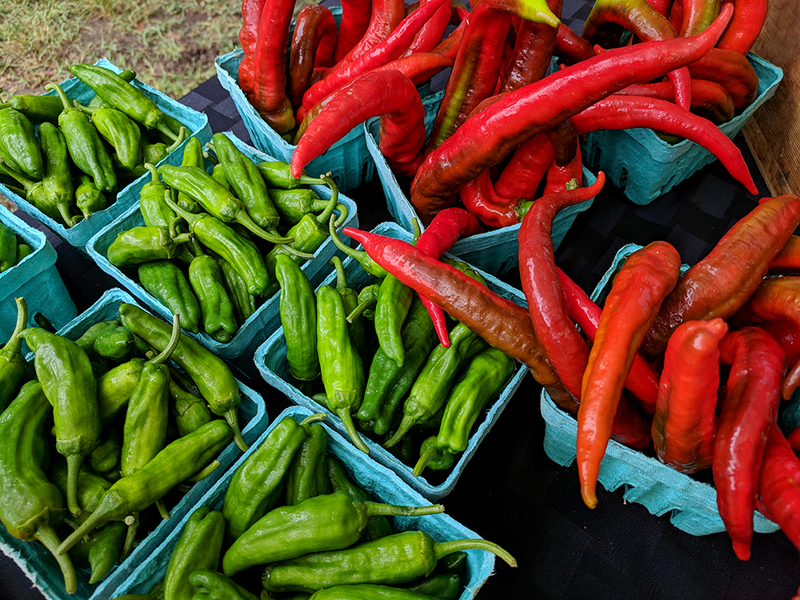 Four farmers’ markets in the county provide residents with ample opportunities to shop and interact with local growers throughout the long growing season. Many area farms offer opportunities for on-farm visits where visitors get the chance to make the connection between food and agriculture. Small farms also provide many indirect benefits. They help maintain open space valued by people and wildlife. Visitors flock to Chatham for the beauty of its rural landscape. The challenge is to preserve this rural landscape in the face of development pressures from Raleigh and Chapel Hill. One way to preserve the rural landscape is to help keep farms in the county. The Chatham County Center of North Carolina Cooperative Extension has long recognized the value and importance of the sustainable agriculture practiced by small farms in the area. In 1994, the Chatham County Center created a new county agent position to support the unique needs of these small farmers. Today, this position is fully funded by the Chatham County government, which recognizes the value of sustainable agriculture to the county. Chatham County Agricultural Extension Agent Debbie Roos works with farmers to promote increased awareness, understanding, and practice of sustainable agriculture through monthly educational workshops, a website, on-farm visits, and other consultation. Roos developed the Growing Small Farms website in 2002 after a survey revealed that approximately 95% of local farmers regularly used the Internet. The site has since grown to over 500 pages and receives over 25,000 visitors each month. Growing Small Farms is also on Twitter and Facebook. Farms don’t exist without consumers, so please take the time to get to know the farmers in your community and support their efforts to keep Chatham County green! Visit our farmers’ markets to purchase the freshest vegetables, fruits, meats, baked goods, and other products, all grown or made locally by the person selling it to you. The Buy Local Guide lists community supported agriculture farms, on-farm stands, pick-your-own farms, wineries, and more. Check out the local farm profiles and farm photos on this website for a glimpse of the diversity that allows Chatham’s farms to prosper. Learn more about Extension Agent Debbie Roos.